“It was a lonely, moral stance. And it cost him. But it set an example of what is required of us if we are to honor our deepest values in times of crisis, even when silence would better serve our personal interests or the communities and causes we hold most dear. It’s what I think about when I go over the excuses and rationalizations that have kept me largely silent on one of the great moral challenges of our time: the crisis in Israel-Palestine. “I have not been alone. Until very recently, the entire Congress has remained mostly silent on the human rights nightmare that has unfolded in the occupied territories. Our elected representatives, who operate in a political environment where Israel’s political lobby holds well-documented power, have consistently minimized and deflected criticism of the State of Israel, even as it has grown more emboldened in its occupation of Palestinian territory and adopted some practices reminiscent of apartheid in South Africa and Jim Crow segregation in the United States. 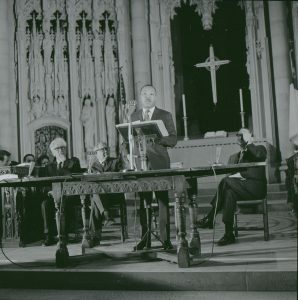 “Just as King received fierce, overwhelming criticism for his speech condemning the Vietnam War — 168 major newspapers, including The Times, denounced the address the following day — those who speak publicly in support of the liberation of the Palestinian people still risk condemnation and backlash. Bahia Amawi, an American speech pathologist of Palestinian descent, was recently terminated for refusing to sign a contract that contains an anti-boycott pledge stating that she does not, and will not, participate in boycotting the State of Israel. Available for a limited number of interviews, Fischbach is professor of history at Randolph-Macon College and author of the just-released book Black Power and Palestine from Stanford University Press. He recently wrote the piece “The Firing of Marc Lamont Hill Raises This Question” for History News Network.